Get the builds and drops in your tracks right with the help of our five tips and you'll be well on the way to dancefloor success. For more advice on mixing for the club, pick up the October 2018 edition of Future Music. Builds and drops vary stylistically, but a universal approach is the use of volume change over time. 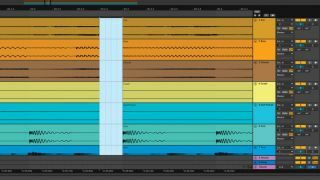 Automate the levels of drums and FX risers, or temper them back so that drop elements hit harder. Your drop should contain sizzling highs and deep sub bass. Enhance this by progressively restricting the prior build-up’s frequency content towards the drop - automate gentle EQ high- and low-pass filters to do this subtly. Mixing live MIDI and softsynth signals in a project can be restricting compared to working with ready-printed audio stems. Why? Well, if your track parts are consolidated to audio, those swamping reverb effects and overlapping delay signals can be tightly chopped and faded to help maximise stark edits, silent gaps and dancefloor flow. On lightweight speakers, the task of subtle sub bass removal is easily overlooked. Subtle 50Hz high-pass filtering has a huge ‘cool-down’ impact over club or festival systems - cut the lowest bass for smooth one- or two-bar edits at the end of 16 bars. Volume-shaping plugins such as Cableguys’ VolumeShaper and Xfer Records’ LFOTool are must-own mixing effects for customising build-to-drop transitions. Dial in gradual onbeat pumping, sidechain-style offbeat curves or bespoke four- or eight-bar level ramps on sounds that need them.